This was a big week in college football and the Big Ten had one marquee matchup that turned into a bit of a dud. Here ya go! I was really looking forward to watching this game, and then it started, and well, I started doing laundry… The most exciting moment for me was one of the better interceptions you’ll see all year and the goofy centipede formation by coach Jim Harbaugh. The Wolverines went into halftime with a 7-0 lead thanks to a touchdown from fullback Khalid Hill. Wisconsin answered in the third when freshman quarterback Alex Hornibrook connected with Dare Ogunbowale for a 17-yard touchdown strike. Michigan would recapture the lead midway through the fourth when Wilton Speight hit Amara Darboh for what would turn out to be the game-winning 46-yard score. I thought it was pretty silly earlier in the week when I saw that Michigan State was only favored by six points over the Hoosiers. Late last night I felt pretty silly myself for thinking that I knew more than the sharks in Vegas. The Hoosiers’ victory allowed them to reclaim the Old Brass Spittoon for the first time in a decade. What exactly is an old brass spittoon? I have no idea, but it sounds pretty mysterious and I would love to have one of my own someday. Richard Lagow led the Hoosiers as he completed 16 of 26 passes for 276 yards and a pair of touchdowns. Lagow was also on the receiving end of a five-yard score in the third quarter. Devine Redding led all rushers with 100 yards on 19 carries. Senior wideout Ricky Jones added 124 yards receiving and a touchdown. The Spartans’ three-headed backfield of Gerald Holmes, Madre London, and L.J. Scott combined for 128 yards rushing while Tyler O’Connor added 36 of his own. O’Connor connected on 21 of 35 passes for 263 yards and three scores. R.J. Shelton had himself a day as the senior hauled in seven passes for 141 yards and a touchdown. Michigan State kicker Michael Geiger missed a 49-yard field goal attempt in overtime. The Hoosiers returned the favor with a miss of their own, but the Spartans were flagged for leaping which gave Indiana new life. Griffin Oakes would then knock in the chip-shot 20-yarder to bring the Hoosiers to 3-1. Illini jumped out early and controlled the game until the fourth quarter when tailback Terrell Newby led the way in a fourth quarter that saw Nebraska score three touchdowns. The senior ran for 113 of his 140 yards in the game’s final quarter and scored twice on his own. Tommy Armstrong completed 16 of 23 passes for 220 yards with a touchdown and an interception. He also found the endzone once with his legs. Jordan Westerkamp led all receivers with four receptions for 65 yards. The Illinois offense had a pretty lackluster day, totaling just 270 yards. Wes Lunt was 13 of 22 for 133 yards. Reggie Corbin led the Illini ground game with nine carries for 72 yards. Lovie Smith’s squad struggled to convert in enemy territory and had to settle for three Chase McLaughlin field goals. Penn State steals a victory over Minnesota behind the play of the entire team. The Hawkeye fanbase has to be elated that the administration and athletic supporters elected to keep Kirk Ferentz around for another decade or so. Since the extension was announced less than a month ago, Iowa has fallen at home twice. Two weeks ago it was to North Dakota State of the FCS and yesterday’s loss came at the hands of a Northwestern squad that was 1-3 heading into the matchup. Quarterback Clayton Thorson and tailback Justin Jackson accounted for all five of the Wildcats’ touchdowns. Thorson threw for 164 yards and a trio of scores while adding another with his legs. Jackson rushed for 171 yards and, with the game tied at 24, scored on a 58-yard scamper late in the third quarter. Senior wideout Austin Carr hauled in all three of Thorson’s touchdown passes. The Hawkeye offense could only manage 283 yards on the day. C.J. Beathard threw for 204 yards with one touchdown and one interception. LeShun Daniels Jr. ran for 72 yards and a score. Akrum Wadley struggled to get anything going as the junior rushed for just 35 yards on 14 carries, though he did find the endzone twice. Looking at the bright side for Iowa, they may be able to avoid about $2 million that Ferentz is set to bring home (over the length of his contract) if the Hawkeyes reach seven wins on the season. That could help to make a ridiculous buyout a little bit less absurd. Note: Internet searches for “Kirk Ferentz buyout” peaked around 2:30PM yesterday. The Terrapins are not as bad as many thought they’d be. In his first year at the helm, D.J. Durkin actually has Maryland looking like a solid football team, and his Big Ten debut was a memorable one. Yes, Purdue is awful, but the Terps were damn impressive on Saturday as they moved to 4-0 on the season. Not a bad little weekend in the conference. The Hoosiers handing Dantonio his second conference loss was a bit unexpected. The Buckeyes obviously rolled over Rutgers and neither Michigan nor Wisconsin did anything that should invoke fear across the state of Ohio. Next week’s conference slate can best be described as “meh.” Michigan is traveling to Rutgers where they will surely trounce the Scarlet Knights. The Spartans host BYU as they will look to avoid a third straight loss. The Hoosiers – who have been a tad bit pesky lately – will make their way to Columbus. Are the Durkin-led Terps going to screw around and end up in the Top 25? A win at Happy Valley next week could certainly help their case. Week 4…. Conference play kicked off this weekend…. Here ya go! Redshirt freshman Alex Hornibrook’s first start was a memorable one for the Badgers as they knocked off the Spartans. The Badgers – led by a defense that forced four turnovers – would go on to hold the Spartans without a touchdown. Hornibrook tossed a touchdown pass and Corey Clement found the endzone in the second quarter to give Wisconsin the edge and they never looked back. The freshman ended the day 16 of 26 for 195 yards with one touchdown and one interception. Corey Clement found the endzone twice but could only manage 54 yards on 23 carries. Jazz Peavy led all pass-catchers with four receptions for 96 yards. Word has it that the Spartans may be on the verge of a bit of a quarterback controversy, though their head coach is saying otherwise. Lima, Ohio native Tyler O’Connor was atrocious on the day. The senior was 18 of 38 for 224 yards and three interceptions and his performance has some fans clamoring for redshirt freshman Brian Lewerke. Lewerke came in on the Spartans’ final drive and was 2 of 4 for 26 yards. Senior quarterback Tommy Armstrong Jr. put on a show Saturday afternoon which led to the victory against the ‘Cats. He threw for 246 yards and a score while adding a new career high of 132 yards rushing. Terrell Newby ran for 69 yards and scored a touchdown of his own. Clayton Thorson led the Northwestern attack with 292 yards of total offense to go along with a pair of touchdowns. The sophomore was also picked off twice. Justin Jackson led the ground game with 79 yards while Austin Carr was the game’s leading receiver with 109 yards and a score. With three losses already on the young season, the Wildcats have matched their total from last year’s 10-3 campaign. Next weekend’s headliner will certainly be the Badgers traveling back to the Mitten State to take on the Wolverines. The Buckeyes will host Rutgers and Michigan State will be looking to bounce back in Bloomington. The Big Ten remains top heavy heading into this season but their best teams all reside in the same division so there will be some major collusions featuring Michigan, Michigan State and Ohio State. The winner of the East could very well be the champion of the Big Ten but I’m certain Iowa and Wisconsin will have something to say about that. The Hawkeyes are currently the favorites to repeat as West but Wisconsin has restocked their roster as well as Nebraska. The Big Ten may not be the deepest conference of the so-called Power 5, but its top teams should play significant roles when it comes to the national title picture that’s for sure. The conference had more players drafted in the first three rounds – the ones that matter – than the SEC, and everyone else. B1G joins the ACC as the only league to have two different teams in the first two years of the College Football Playoff, it had some high-profile moments this last bowl season – nothing to see here with the Rose, Sugar and Outback, though – and more than anything else, the conference’s programs are really, really, really rich, and getting richer. Eight Big Ten schools – with newbies Maryland and Rutgers, along with Illinois, Indiana, Northwestern and Purdue just on the outside – are in the $100 million athletic department club in annual revenue generated, while the Big Ten Network is definitely printing money for the schools. In short, all this means it’s easier to keep around the Harbaughs, and the Meyers, and the Franklins, and the Dantonios and it’s easier to attract the Lovies, and have the Schianos as assistants. And soon, it might be easier to attract more programs to expand even further. But that’s for another day. On the field, the Big Ten is better when Michigan is one of college football’s elite programs. It’s back with Jim Harbaugh the most interesting man in the world, while Ohio State continues to be special, Michigan State not going anywhere, and a resurgent Penn State about to be a whole bunch better over the next few seasons. Throw in the improved coaching situations at Maryland and Rutgers, and with Indiana no longer a speedbump, and the East is going to be fascinating. Can Nebraska start to get the right breaks and be better and stronger under Mike Riley? Probably. Iowa has another great team returning, Wisconsin is going to have a running game again and be dangerous, Northwestern and Minnesota are still solid, Illinois should be far better in a hurry under Lovie Smith, and Purdue has its best team yet under Darrell Hazell. Michigan at Ohio State, Nov. 26 – All due respect given to Michigan State, who gets the Wolverines and Buckeyes at home, but the rivalry of all sports rivalries will matter more than ever now. It might be for the Big Ten East – and, effectively, the Big Ten title – after the game not making a difference in the race last year, and while Jim Harbaugh can’t do any wrong, it’s not going to sit well if he’s 0-2 against Urban. Here is our overall Big Ten Predictions…. “IF” all things go according to our prediction, Ohio State and Wisconsin will face off December 3 in Indianapolis for the Big Ten Championship with the Buckeyes winning it all going into the BCS Playoffs. Even by the Big Ten Network poll, Ohio State was chosen to win it all – click here to read! 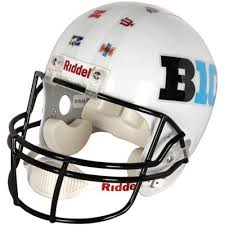 Last Big Ten undefeated team remained the last undefeated team as the crush the Illini. The Cornhuskers did it on the ground, as Ameer Abdullah, had 208 of Nebraska’s 458 rushing yards and scored the first three touchdowns. Illinois made it 28-14 with a long Geronimo Allison touchdown reception, but Nebraska scored the last 17 points of the blowout. Have you ever seen a game where both teams really don’t deserve a victory? Well, this is one of them… but in the end Iowa got it done. The Boilermakers struck first with a pick-six by Frankie Williams and a field goal to go up 10-0, but nobody on Purdue’s low-powered offense (2.3 yards per pass, 2.8 yards per rush) besides Akeem Hunt could do a single thing to protect the lead. Just when you thought Indiana was on the right track after a big win against SEC foe Missouri last week, the Hoosiers go Hoosier. The Terrapins C.J. Brown and Caleb Rowe combined for 361 passing yards as Maryland brushed the Hoosiers aside to win its first-ever Big Ten game. Even with injuries to the offense, the Terrapins have been one of the most consistent Big Ten teams so far (one pass defense meltdown against West Virginia aside). Their home game next week against Ohio State will demonstrate where in the conference’s pecking order they fall. And with three road wins to date, Maryland is the senior day opponent nobody wants to play. For Indiana, it’s back to the drawing board. On the bright side, Tevin Coleman kept his streak of games with 100+ rushing yards alive and the Hoosiers still have several gimme games to get to bowl eligibility. The Golden Gophers knocked off the Wolverines pretty handily especially in the second half as they took advantage of turnovers and field position, which turned in to a 27-7. The Gophers reclaimed the Little Brown Jug for the first time since 2005. They out-gained them 373 to 171. To make matters worst for the home team, when the PA announcer claimed 102,000 fans were in attendance (thus keeping Michigan Stadium’s 100,000+ attendance streak alive), Wolverine fans booed the obviously fraudulent number. The ‘Cats capitalized on mistake after mistake from the Nittany Lions’ and knock them off big up in Happy Valley. Although the Wildcats took a 14-0 lead in the first quarter, it was assumed that Christian Hackenberg would lead a comeback win. But Penn State could manage only two field goals through three quarters, and consecutive turnovers in the fourth quarter (including a pick-six) drove PSU to its doom. Nothing any worst than losing a key player for the season, as running back Paul James, suffered a torn ACL. But the Scarlet Knights used the ‘next man up’ regimen and put away the Green Wave with little trouble. The Spartans continue winning and blew out Wyoming. Jeremy Langford rushed for 137 yards and a touchdown, while backup QB Tyler O’Connor ran for a touchdown and passed for another. Talk about a slow starting game… it was 3-3 at the half. But in the second half the Badgets got things going as Mr. Melvin Gordon flexed his muscles and got his stride going strong as he rushed for 181 yards and two touchdowns. Alex Erickson had six catches for 91 yards. Week 5 is in the books… next week, Nebraska-Michigan State should be Big Ten Game of the Week!